My friend's dad makes the most amazing cajun seasoned chicken kebabs, and I thought I would try my hand at them too. 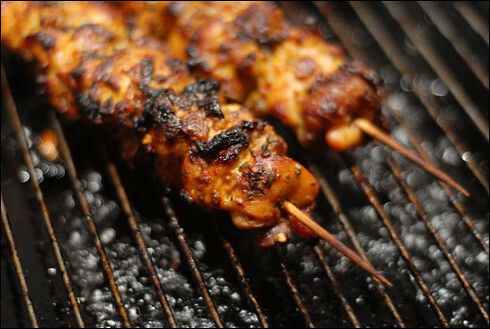 Sadly it is no longer barbeque season, but if you have a grill it needn't mean the end of delicious, slightly charred kebabs until next summer. These were lovely served with a simple green salad and new potatoes. First, mix together the cajun paste, chilli flakes, olive oil and lemon juice in a large bowl, then crush and mix in the garlic. Season with a little salt and pepper. Next, cut the chicken thighs into 3cm strips and marinade for up to two hours in the fridge. When ready, roll up each slice and add to the skewers until all the chicken is used up. Place under a hot grill and cook for 15-20 minutes, turning occasionally. Test the meat before serving - it should be piping hot with no pink flesh and the juices should run clear when a knife is pushed into the meat.